Opadry® EZ, Easy Swallow Film Coating System, provides high slip finish, leading to an improved patient experience, as tablets won't stick in the mouth or get lodged in the oesophagus. And, the superior gloss finish that coating with Opadry EZ Clear provides also enhances the appearance of any tablet. To demonstrate the superior mobility imparted by Opadry EZ film coating, a novel in-house method was developed to model dynamic friction. This model was used to determine wet slip behaviour; the coated tablets were pulled across a water saturated surface, using a weighted sled, as shown in Figure 1. 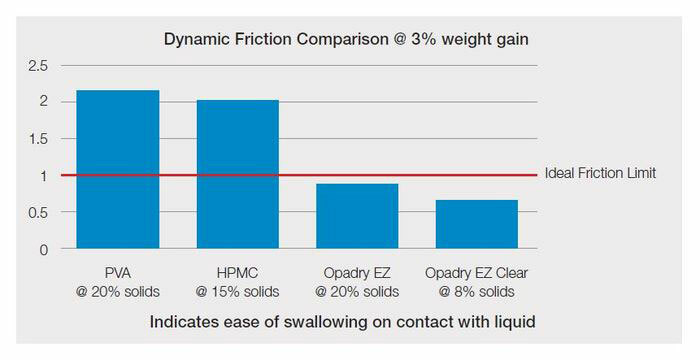 Compared with PVA and HPMC-based coatings, the dynamic friction results obtained with Opadry EZ clearly demonstrate lower friction and therefore increased slip (Figure 2). To gain further insight, access a poster recently presented by Colorcon at 2017 AAPS Annual Meeting.